Not long ago, when I visited my my parents in Manitoba, my mom pulled out a license plate that had adorned my childhood bike for years. This was a big deal: in the 1970s, you never found the name “Leanne” on any paraphernalia. 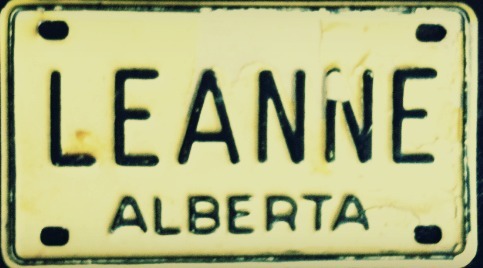 What was even more curious was that this was an Alberta license plate, the province that would become my home nearly thirty years after that yellow-and-black rectangle hung behind my banana seat. I am drawn to names and to name stories. 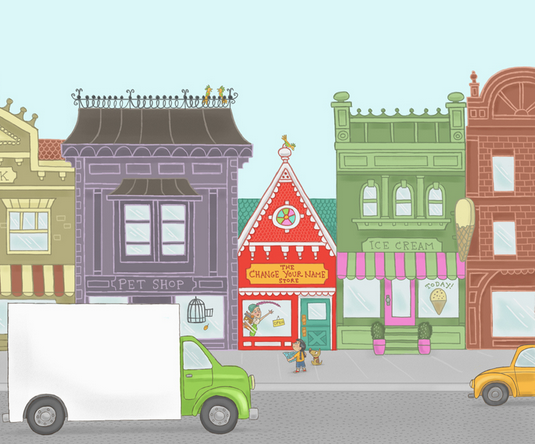 For those of you who read this blog regularly, you may know that I have a picture book coming out May 2014. I’d love to hear if you ever had any paraphernalia that had your name on it. I can hardly wait to see that book, Leanne…looks great! Yay for the new book! I do like that cover. Michelle is pretty easy to find, and when I was a kid I had several different key rings with my name on them. Of course, I was too young to drive, so I had no keys. But that’s what the names were always on in the souvenir shops on vacation. Beautiful cover! I’m excited for the book. Sadly, with the name “Karyn” I have yet to find a pre-made item with my name on it (thanks a lot, dad). And there was NO WAY I was accepting the consolation prize of “Karen.” By about the age of 6 I had taken to spelling my name for people before I said it just to make sure they wrote it down right: “What’s your name, dear?” “It’s k-a-r-Y-n Karyn.” The things we do to our kids! Beautiful cover! This is so exciting! My favorite name paraphernalia story is when #5 went on a camping trip recently to a place with a gift store. He wanted a pocket knife with his name on it, but they didn’t have any with “Alex”. So he came back with one that says, “Alejandro”. (all those years of Go, Diego, Go paid off). Congrats! As an illustrator, I love her work. I don’t remember my mom ever buying anything with Susie on it. I may have to make up for this slight….Its not too late. Right? Love the cover – can’t wait to see the book! Janice was surprisingly tricky to find in the 80s. Lots of Janis and Janet. I had a mug and a custom-made t-shirt with my name screened on. It was very ahead of its time in 1981. I absolutely love that. Beautiful! Beautiful illustrations… Really. Can’t wait to see more! I can never find my name on anything, I mean how could I expect to… My name is Kiersten, uniquely named and spelled. Fun fun. Love the cover! Can’t wait to see the whole thing! Very cute cover!! How exciting! My book has a terrific cover that everyone raves about; then you open it and see the print size–9 font. Magnifier anyone? While the cover is important, having it printed correctly is probably more important. You said you were interested in knowing what we had with our names on it. I may not have a license plate (I’m considering one after seeing yours), but I do have a half dozen name plates for desks and doors; plus a dozen different name tags from all my varied jobs as a nurse. Now that I’m retired, I have no idea what to do with them. Maybe I’ll have them stuffed into my casket. My 2 favorites–the door tag with one magnetic end that you slapped onto the door frame when you were in a patient’s room. Of course, it was a 10″x2″ rigid plastic board that you had to carry around in your pocket; but I liked the hard slap it made when it connected. Easy way to relieve some stress. My favorite name tag was the small gold one I bought for myself when I finally got my board results and could put RN after my name. I was always surprised when I found something that had my name on it. The best was a perfume. Plus is smelled good. The worse was a bad horror flick titled Tamara. blech. Are you kidding? My real legal name is Misty. I have never found anything with my name on it ever! Then again, maybe I should have gone over to the stripper district. Betcha they have lots of stuff with that on it. I have never been lucky enough to find any paraphanelia with my full legal name on it, much less my nicknames (and I have several). Of course then I went out and got dogs…who are also not that common. I got so excited when I found a magnetic guard dog sign with their breed and picture on it a little over a week ago! It’s always the little things, right? By the way, cover is adorable! LOVE the cover, cant wait to read the book! I didn’t know book 2 was a picture book! That is awesome! The cover looks great. Can’t wait to read it! My real name is Bronwyn. There was never ANYTHING with my name on it. One time, my aunt had a key chain specially made for me. I thought it was amazing. Despite my bizarre name (and the horrifying meaning) I love names and think they have a lot to do with who we are. Even in Quebec (where we regularly visited family when I was growing up) I was unable to find ANYTHING with “Aimee” on it. Despite this, my mom went through a heavy phase of collecting various tchotchkes with names on them. She was able to find my sister’s & brother’s names (also ethnically French) but not mine. For 15 years there was a sad, sad, totally-unused mug hanging in the kitchen, with a highly unapologetic “Amy” on it, next to my siblings’ properly spelled mugs. The world is truly yours these days!